At Hiking Mastery, we love backpacking and everything else life in the wildness has to offer. Even more than that, we love sharing our experience and findings with fellow lovers of outdoor life. Today we bring you an in-depth look at the ALPS Mountaineering Chaos Tent and what makes it tick. Every backpacker wishes to have a safe and comfortable place to rest and shed off the thrill of the day’s adventure. The Chaos tent is designed to give you that place without breaking your back on the way. The tent comes in two sizes with the smaller size meant to accommodate two people and the larger one meant for three people. Dimensions: 56x86x38″, Total Weight: 5.38 lbs. In this particular assessment, we will focus on the ALPS Mountaineering Chaos 2-Person Tent. The tent has become a favorite item with many backpackers owing to its great features that were made with the camper’s safety and comfort in mind. 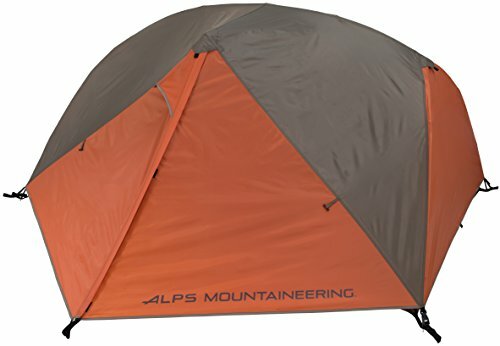 This 2 person tent from ALPS Mountaineering is lightweight, has excellent ventilation and has strong weatherproof features. It is designed to give warm weather campers a comfortable and safe place to lounge and rest between the long trekking days. The 3 season tent gives you a place to relax so that the next day you are ready to explore nature’s mysteries some more. The tent itself has dimensions of 41 x 56 x 41 inches and weighs 4.9 pounds. When it is shipped, it will weigh 6.6 pounds due to the padding and care, taken to not break the items during delivery. The tent comes with a rainfly, 7075 aluminum stakes, 7000 series aluminum poles, pole bag, tent storage bag, stake bag, guy lines, repair swatches, and mesh storage pocket. The tent storage bag compacts it down and makes it small enough to comfortably fit in your backpack. The polyester fabric on the fly stretches out really well with no risk of damage and resists UV damage. The fabric of both the fly and the floor are coated with urethane and their seams are factory sealed to keep you dry on rainy days. The vestibules and doors have extra large #8 zippers, which never get stuck, giving you a seamless experience when opening or closing the tent. 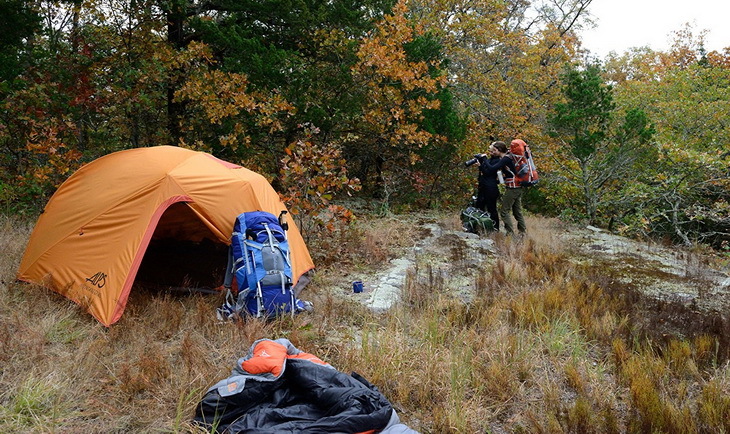 If you have ever encountered a faulty tent zipper, then you know how frustrating that can be. These extra large and sturdy zippers open and close effortlessly. A combination of the above features makes the ALPS Mountaineering Chaos 2 tent a strong contender on the list of the best 2 person 3 season backpacking tents. Although it is a little heavier than some other 2 person tents, the Chaos 2 person tent proves that it is worth the extra pound or two. It’s strong and weatherproof materials are worth that little extra weight. In reward for bearing the extra weight, you get yourself a safe and comfortable little home in the wilderness. 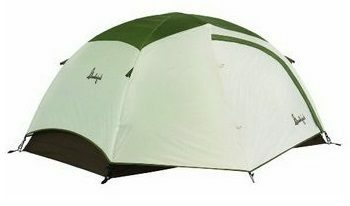 The extra weight includes a rain fly and the tent comes with more poles than most of the other same size tents. At 33 square feet of floor area, the Chaos 2 tent, has ample space for two people to sleep comfortably. The tent is made even more spacious with two vestibules, which add 17 square feet each. 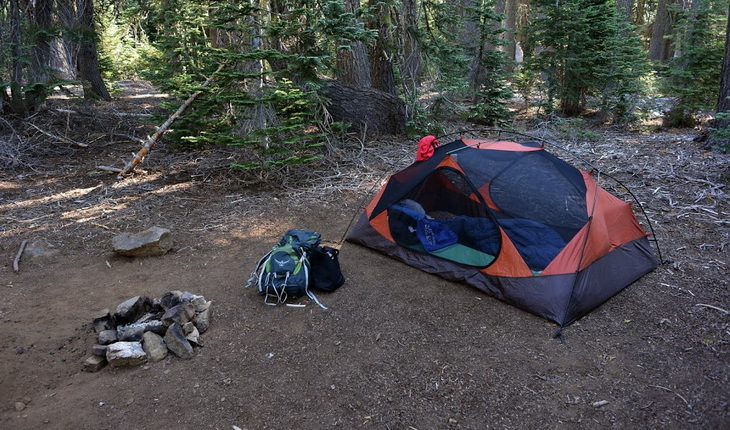 The extra space can be used to keep your gear so the main tent area is free of clutter. Its space is just perfect for two people who want to snuggle the night away while gazing at the stars. 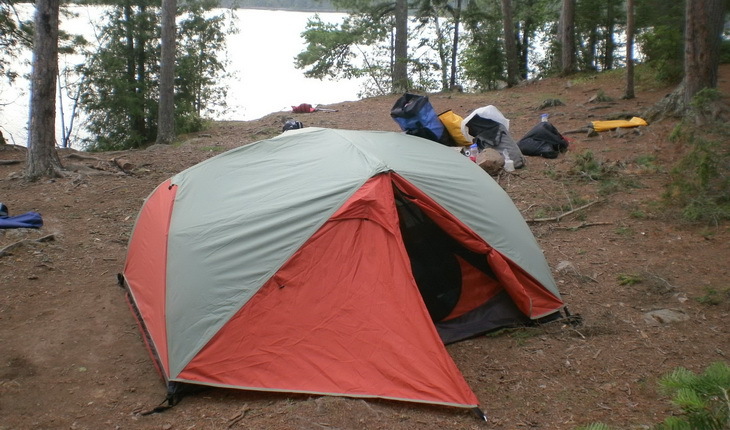 If you want to sleep separately, however, you might want to consider using a 3-person tent for two people instead. The Chaos 2 tent is a very sturdy tent with several features aimed at enhancing stability and protection. The full coverage weatherproof fly clasps onto the tent for maximum protection and has extra guy-outs for more stability in case of bad weather. The two vestibules also add more protection in times of harsh weather. The polyester fabric on the fly stretches out really well with no risk of damage and resists UV damage. The fabric of both the fly and the floor are coated with urethane and their seams are factory sealed to keep you dry on rainy days. The door and roof are made out of mesh to allow free movement of air into and out of the tent for maximum aeration, keeping the tent cool and fresh even on hot nights. The mesh top will also allow you a view of the sky without leaving the comfort of your sleeping bag while the ventilation brings in the cool outdoor breeze to give you a peaceful sleep even on a hot night. 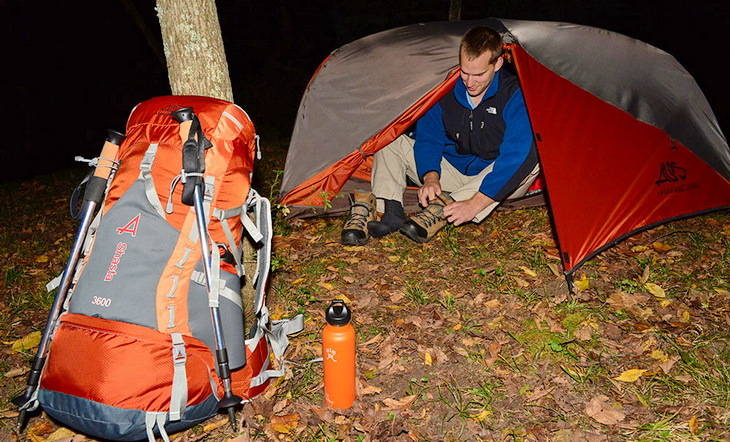 Setting up your Chaos 2 backpacking tent is very easy. The instructions are attached to the inside of the tent, but after the first time, you will probably never need to refer to the instructions again. Thanks to the corded continuous pole system, this is one of the easiest tents to set up, and thanks to the clips that easily snap over the poles make the setting up even faster. The setup instructions are printed and sewed onto the inside of the tent if you need to make reference, although that is highly unlikely, since the setup process is really straight forward, and after some practice, the whole process should take you about five minutes or even less if you have some help. Using your tent is simple, as the zippers and flaps all work flawlessly, and you can sleep with ease. The ventilation is great so you do not feel overheated or claustrophobic. 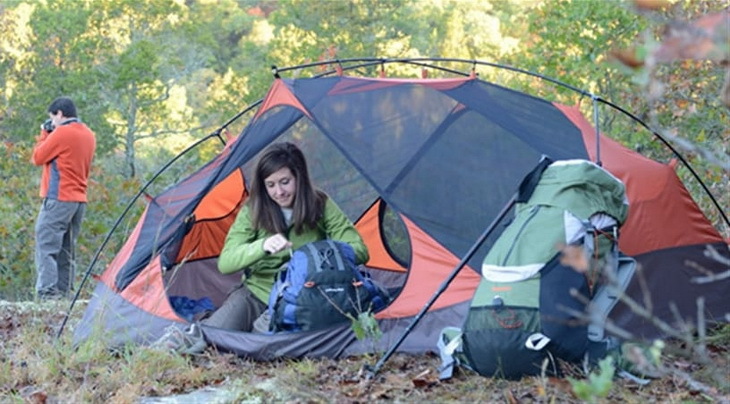 Overall, this is a simple-to-use tent, as well as easy to put together. 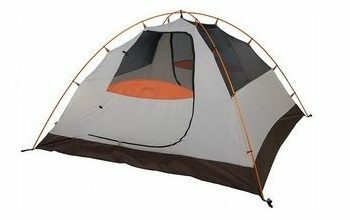 Users find it hard to believe that this tent is so reasonably priced for what you get. All of these great features, include the amount of space, surely, make it seem like this tent would be hundreds of dollars, but it is not. With the ease of portability, use, and overall great materials, users have swooned over how wonderful the value for the money is with this piece of equipment. Below are some similar products on the market for you to consider and compare to this particular tent. You can also gauge what features are out there and make the best decision for you and your camping partner. Keep in mind that if you require more space, you can always get a 3 person tent and enjoy the extra room by sprawling out. The Kelty TN is not heavy by any means, and is compact so you can take it along with you on your backpacking trip. There is a Stargazing Fly that can be seen at night and enjoyed as you get ready for sleep. The entry is easy to get inside of and putting together this tent is a breeze and should take you only minutes to set up. It also goes down easily and will store simply in with your other gear. Made with 70 D Nylon, this 3 foot high tent has a floor area of 27.5 square feet and a Tent Cube storage system. It only comes in one size, and one color, which is black. 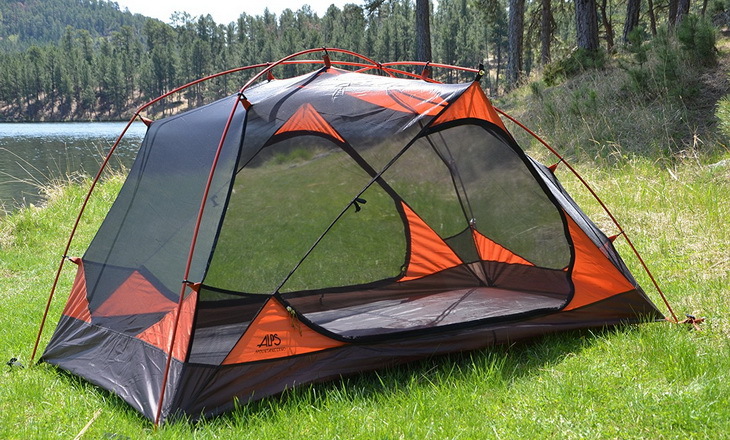 Users did enjoy this tent because of its design and the sturdiness of the poles. During heavy rain, this tent stayed dry to the bone, as users stayed inside to rest up for the next leg of their journey. The down side to this tent is that some users thought it was a little snug for 2 people. They stated it would fit an adult with their gear and maybe a child. If you are a big or tall person, you might want to upgrade to a 3 person tent. Some users complained of poor quality materials, as they had punctured their tent somehow. But, an overwhelming amount of users enjoyed this tent and say they will use it for many more trips. The Slumberjack Trail is 6 feet high, so you do not feel like you must crouch all the time. Made of polyester, this tent is easy to set up due to its Color Coded Construction and the Buckle Connection. The poles are made of fiberglass, with the material being made with the 75 D version of polyester, ensuring its strength. With a lot of inside space, you will surely get two people inside, along with your gear. Users like that this tent is free standing and made with all mesh, so they can get a view of the stars at night time. It has a couple of inside storage pockets, so you can put your important items in there. 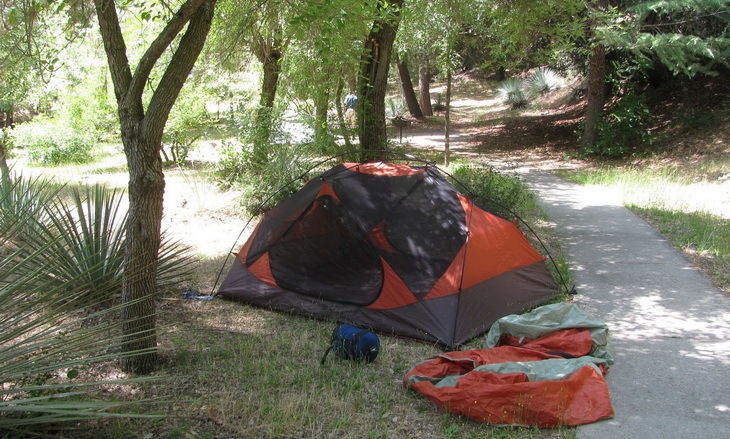 Users also raved about the Color Coded Construction, which allowed them to put their tent up in mere minutes. The full coverage rain fly, as well as the vestibule, ensures that you are dry as the rain drops come down, which is much needed when you find yourself stuck in bad weather. The downside to this tent that users did not like is that it only has one door, as well as one vestibule. Some users had trouble with their poles breaking. Also, it only comes in one color, which is Green. Overall, users say that this tent exceeded expectations and they would highly recommend it to their friends and those who love the outdoors. The ALPS Mountaineering Lynx is easy to assemble and offers a lot of ventilation, which means it will not be humid inside. This tent has 2 doors as well as 2 vestibules, where you can put your items that need to be stored. For better ventilation, this tent was made with half mesh walls. The rain fly and the floor seam have been sealed for weather protection. Included with this tent, are aluminum stakes to tie down your tent, Guy ropes, Mesh storage pockets and a Gear Loft. The 75 D polyester fabric reduces sun damage and ensures a strong tent. The flooring is made from the same polyester fabric and is also made with taffeta, with a coating to keep the tent dry. 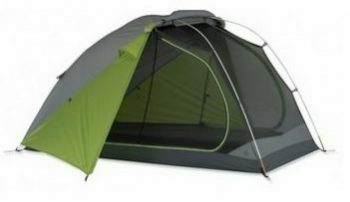 Users loved that this tent was truly for 2 people and their gear and that the ventilation is top notch. During rainy weather, the tent stood up to its name and stayed dry. They also loved the two doors and that the poles of the tent are made of aluminum. Users stated it was a breeze to take down, put into the storage bag, and get on with their backpacking trip. The nice part is that it includes a little hang light so you can see at night, especially if you like to read before bed. The Chaos 2 tent has an overall 4.5 rating on Amazon and its ratings across other authority sites remain in the same range and at times even higher. Of the 88 users who have so far rated it on Amazon, 78% of those users felt that it deserved a 5-star rating and only 4% gave it one star. If user reviews are to be used as the yardstick to measure the performance of this tent, then it is safe to say that with 78% of its users giving it a full vote of confidence, the Chaos 2 from ALPS Mountaineering has made its mark in the backpacking camping community. Many campers have praised this tent’s easy setup process with a couple of people saying it takes them about five minutes to finish putting the tent up. If you have some help and both of you have worked with the tent before, it may even take you as little as three minutes to finish putting up both the tent and the rain fly. This is mainly thanks to its corded continuous pole system. When choosing your backpacking tent, make a list of the basic features you feel will make your camping experience safe and enjoyable and check that list against the various tents on the market to see which one strikes the best balance between your desired features. The ALPS mountaineering Chaos 2 person tent blends the best of the necessary features for an exciting and safe backpacking experience. Its design strikes a good balance between weight, safety, and comfort. Overall, this specific tent is great when it comes to doing its job. You will stay dry, comfortable, and sleep well in this tent, even if the weather outside is less than perfect. With all the great features, such as ventilation and such space, you will surely have room to move about and store your wet gear to dry off inside of this space. With such great reviews from users, it is easy to see why this tent is so great and stands the test of time. 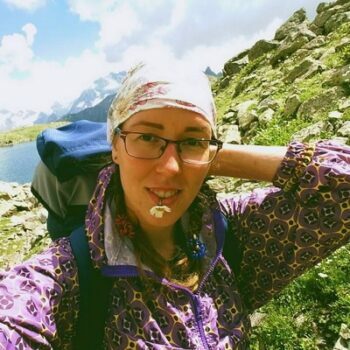 We hope that you found our review to be useful and that you will share it with your friends who are interested in finding out more about the tents. Furthermore, if you feel like sharing some of your experiences with this tent, or perhaps have some questions, don’t hesitate to leave a comment or ask a question in the comments section below. 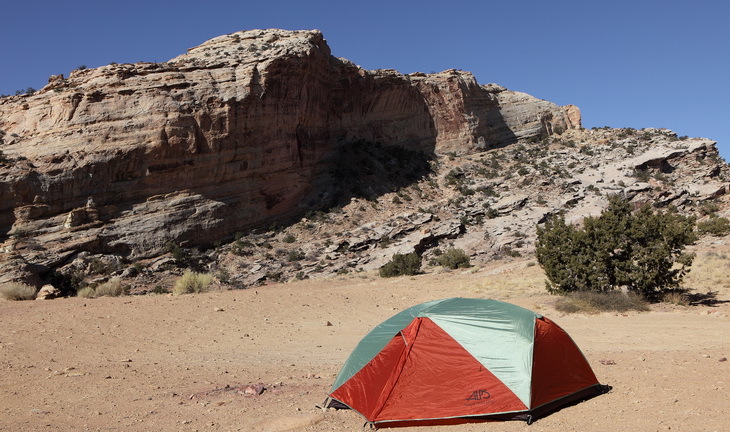 Also, tell us about what kind of tent you have, and how it has stood up over time! We love hearing from our readers!